The events were in the form of a scavenger hunt and a trivia section. 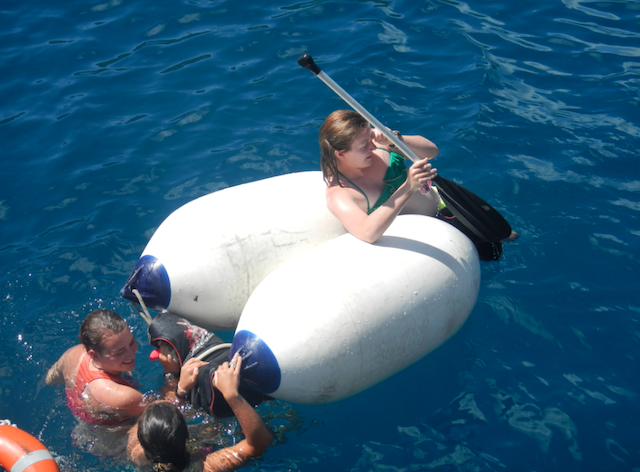 Each team had 5 minutes to grab anything we thought that we would need, and then the activities moved up on deck. Flip cup was the first event of the day, with letters in the bottom of the cup to spell A LADDER. 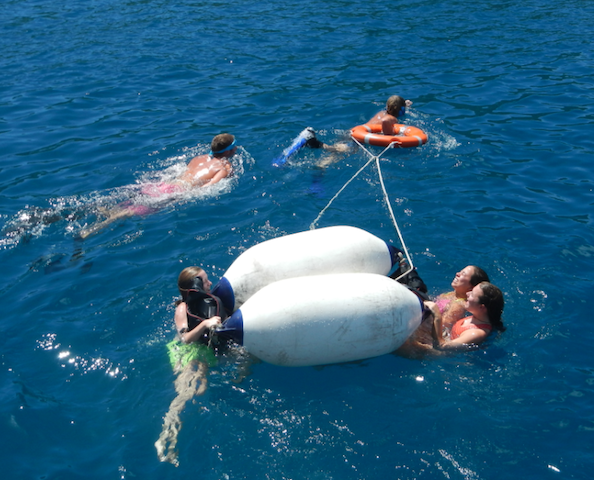 From there, teams were instructed to build a raft with two fenders, two dinghy life jackets, one life ring and an ore or broom to paddle out to Boomrod to collect the next clue. From there, a series of letters were collected from various parts of the boat deciphered by clues that spelled the word IMMERSION, which could only mean one thing. The blind group member was dressed in their new clothes, the infamous Gumby suit. 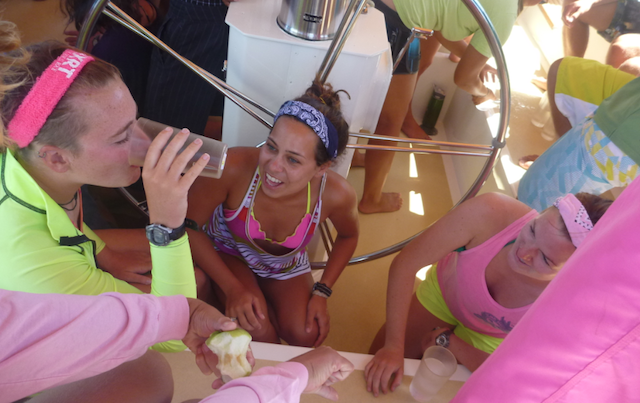 A trip to the bow led to some serious snacking with every member of the watch teams foolishly eating bananas, including the peel in some cases, hanging from strings without their arms. After received a face full of bananas, teams mustered in the cockpit for the next part of the Argo-lympics. Trivia really tested the knowledge of the crew as the teams were asked about questions about their classes, sailing, diving and parts on Argo. The highlight of the trivia was the diving tables question, which led to each watch working together to successfully figure out the pressure group of the diver in the question. This was a big moment because it showed the tremendous amount of knowledge that the entire crew has gained in these short 70 some days. To end the Olympics, the random collection of stuff at the beginning of the games was assembled into a variety of Argo-esque structures. Replicas of Argo were constructed from items ranging from potatoes, oven mitts, to Breton plotters fashioned into masts. A common structure that all teams incorporated was the keel to Argo. Sweaty, dehydrated, and totally stoked from a morning of competing, the crew settled down to a quick and easy lunch of sandwiches and chips. 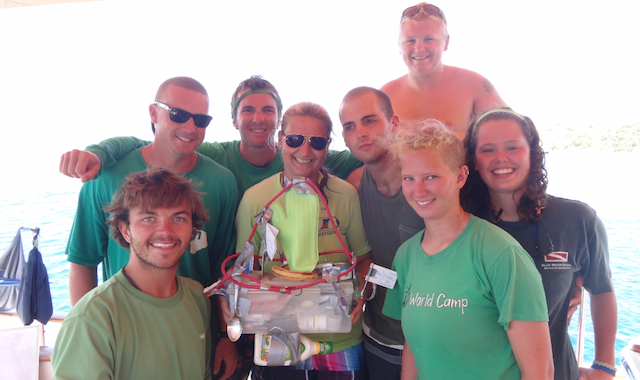 Before this trip, this jam-packed morning of laughter, competition and scavenging would have seemed like more than enough to fit into one day, but on Argo, there is always more time in the day to fit in more life changing activities. 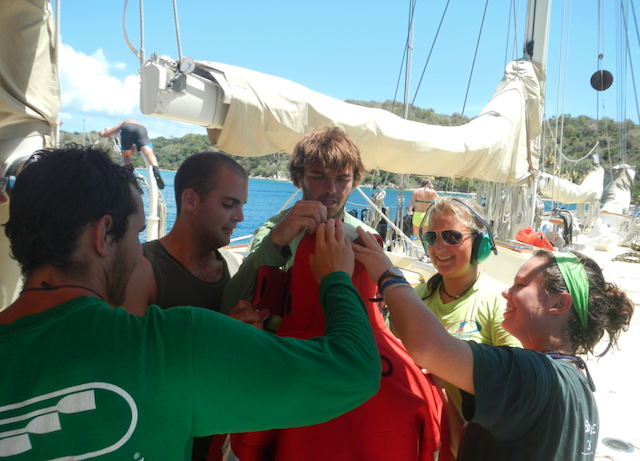 A few students embarked on a day dive for a second attempt at finding the wreck that was nowhere in sight last night. Following that dive, an egg-cellent array of beautifully decorated Easter eggs were made using food coloring and crayons. A few were decorated for beauty and color, while others were made with clever slogans or inside jokes funny only to the Argo family. 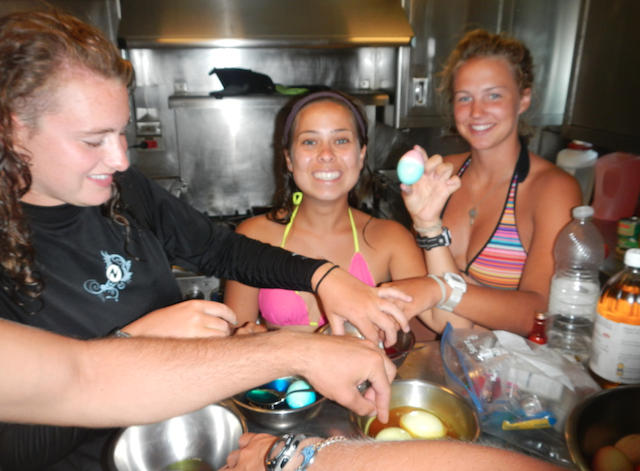 In typical Easter fashion, an Easter egg hunt commenced after the creation of the decorated eggs, only with an Argo twist. 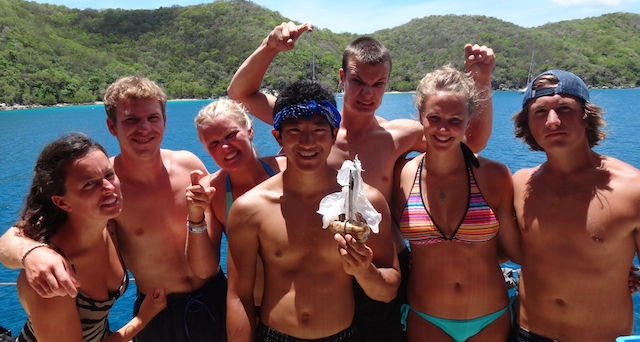 Instead of hiding them around the house, the eggs were hidden among the sand, fish and coral of a near by snorkeling sight with hunters geared up in masks, fins and a snorkel. 36 eggs were decorated in total, but only 32 eggs were recovered, so it is assumed that some of the reef fish found the eggs before their human seekers. Tuckered out and hungry from a full day of fun, the crew settled down to an Asian inspired meal of vermicelli vegetable and beef soup. 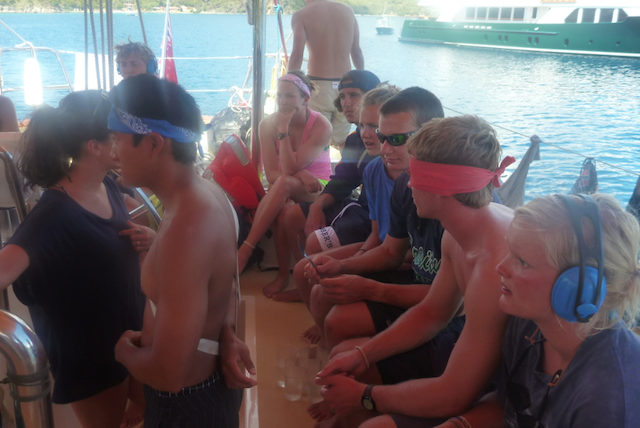 The champions of the Olympics were announced during dinner, and Watch team one will be enjoying cold drinks and an array of snacks for the passage to St. Barth’s. The much-anticipated Argo-lympics had another successful year and couldn’t have fallen on a better holiday than Easter.